The need and the capacity to distinguish between what is acceptable as self and what must be rejected as alien is the evolutionary basis of immunology. In its classic mid-twentieth century formulation, the science of immunology is one of self/non-self discrimination. Proper functioning of the proper body relies on the gatekeeping of an interior, skin-encapsulated ego. A cornerstone of this theory of biology is the principle of natural aversion to self-injury: an individual's cells shall not form antibodies against its own tissue. Conditions of autoimmunity give the lie to this basic evolutionary principle, and thus give rise to paradoxical images of the embodied self. Autoimmune diseases (sometimes called connective tissue diseases) refer to a collection of chronic illnesses wherein normal tissues are misidentified by the endogenous immune system as ‘foreign’. In these conditions, organ damage may occur as a consequence of the body ‘attacking itself’. These diseases number over 100 disparate conditions affecting diverse parts of the organism, among them Alzheimer’s, Parkinson's, and Hashimoto’s diseases, MS, Lupus, Rheumatoid Arthritis and Ulcerative colitis. The frequency autoimmunity is on the rise in Western and Westernised societies, to the point where immunologists speak of an autoimmune disease epidemic. By identifying the material compounds present in autoimmune conditions, researchers have linked these diseases in one way or another to environmental factors such as chemicals and dietary habits. Far from being an impartial arbiter of the organism's outside and inside – the very name immunity is borrowed after all from ancient Roman law – the relation of the immune system to its environment is one of interpenetration and entanglement. The individual's sovereignty over her “own” cellular property grounds both the biology and the politics of immune function in that it provides a clear demarcation of selfhood. Yet the immune system does constitute an identity, yet not one that is proper to the organism, rather it is alongside this identity that the organism itself emerges. This identity is not, as traditionally stated, a demarcation of self as defense against the non-self of invading antigens. It is a self-referential, positive assertion of a coherent unity – a "somatic ecology" – mediated through free immunoglobulins and cellular markers in a dynamical exchange. 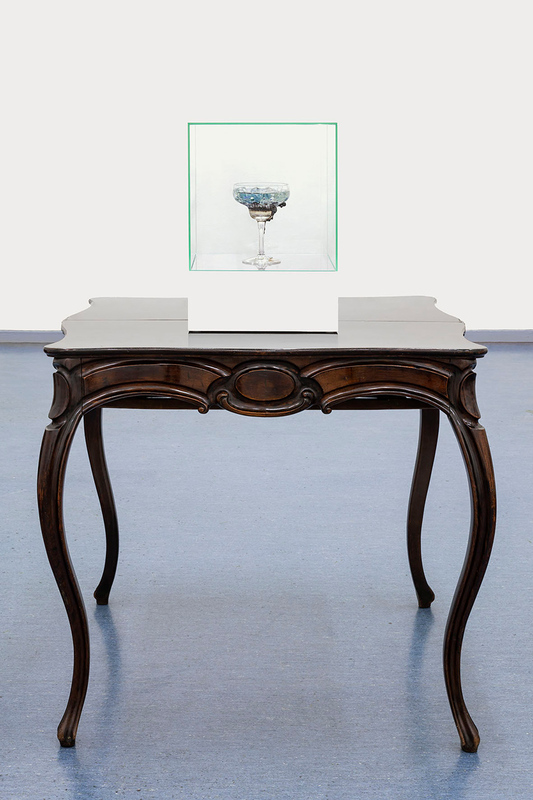 THE GOBLETS, a new series of sculptures by Ane Graff, is presented at Ila pensjonat studios. 1857 will be open Wednesday – Saturday from 12 – 16, and by appointment. Find us in studio 220 on the second floor. Burnet Sir M.Self and not-self: cellular immunology book one. London: Cambridge University Press, 1969:vii. Ehrlich P.The collected papers of Paul Ehrlich. [vol 2]. New York: Pergamon Press, 1957: 253. Katz J D. At the intersection of self and not-self: finding the locus of ‘self’ in autoimmunity. Med Humanit2018; 44: 137. Lerner A, Jeremias P, Matthias T. The World Incidence and Prevalence of Autoimmune Diseases is Increasing. International Journal of Celiac Disease3, no. 4 2015: 151. Varela F. Organism: a meshwork of selfless selves. In: Tauber A, ed.Organism and the origins of self.Boston: Kluwer Academic Publishers, 1991: 88–89. Ane Graff (b. 1974, Bodø, Norway) lives and works in Oslo. She graduated from Bergen National Academy of the Arts in 2004 and currently holds a position of research fellow at the Oslo Academy of Fine Art. Recent and upcoming exhibitions include "Earth – Body" at Museo de Geología UNAM, Mexico City; the Art Encounters Biennial 2019, Timișoara, Romania; "Soon Enough: Art in Action", Tensta Konsthall, Stockholm; “Myths of the Marble”, Henie Onstad Kunstsenter, Oslo, and the Institute of Contemporary Art, Philadelphia; the 11th Gwangju Biennale “The Eighth Climate (What Does Art Do? )”, Gwangju; and ”Surround Audience -The New Museum Triennial 2015", NY. Ane Graff is part of "Weather Report – Forecasting Future" at the Nordic Pavilion at the 58th Venice Biennale, curated by Leevi Haapala and Piia Oksanen of KIASMA, Helsinki. Ane Graff, The Goblets (Alzheimer's Disease), 2019. 42 × 30 × 30 cm. Glass goblet containing: mercury, silver, tin, zinc, copper (from dental amalgam); Arsenic, cadmium, lead, silica dust and polycyclic aromatic hydrocarbons (from Marlboro cigarettes); Clonazepam (from Klonopin Oral Tablets anti-anxiety medication); polycyclic organic hydrocarbons, organophosphate flame-retardants, phthalates, benzothiazoles, musk compounds, plasticisers, magnetite and silica dust (from road and tunnel dust); aluminium zirconium tetrachlorohydrex Gly, cyclopentasiloxane, ppg-14 butyl ether, phthalates (from Dove Sensitive antiperspirant stick); maltitol, sorbitol, xylitol, steviol glycosides, ammonium salt, gum arabic, glycyrrhizin, E153, gum arabic (from sugar free salt liquorish pastilles); diacetyl, perfluorooctanoic acid, tertiary-butyl hydroquinone, trans fats (from microwave popcorn); saccharomyces cerevisiae yeast, mold, gluten, hardened rapeseed oil (from molded white bread); potassium aluminum sulfate (from deodorant); glucose fructose, syrup, glycerol, E133, corn syrup, starch, E420, salt, sugar (from blue icing color); calcium silicate, sodium (from table salt); inorganic copper powders, aluminum salts, and crushed glass in epoxy laminating resin mix. Photo: RH Studio.